Campingpark Bad Liebenzell är en camping i Bad Liebenzell, Baden-Württemberg, belägen vid en flod/ en bäck. Campingen har platser med stängsel, utan skugga och platser med lite skugga. Det finns möjlighet att hyra husvagnar. På campingen finns en lekplats och ett sportområde. Att laga sin egen mat är inte alltid nödvändigt, för på campingen finns en snackbar och en restaurang (mindre urval). På campingen kan du också köpa livsmedel. Det är möjligt att komma ut på internet, därför att på 80% av campingarna kan man komma ut på internet med egen laptop. Denna inspektör gör varje år ett besök på Campingpark Bad Liebenzell och inspekterar campingen för ca 200 faciliteter och för andra förekommande punkter. Inspektören är en medarbetare från ACSI och arbetar inte för campingen. Well maintained site on the edge of the town, directly next to Lidl. The local tax entitles you to free regional public transport, access to the municipal pool next to the site and discounts to the local spa. All worth a visit. used for one night on journey thru from Italy. Well kept clean site, good facilities. Walking secure gate from site to large Lidl next door. When approaching site from south follow signs thru town not satnav. Only two showers in the ladies and one of those has a raised base. otherwise facilities very clean. Campervan discharge area is quite tight to get into with a 7.5m van, only just managed to get the toilet cassette out whilst parked to empty the grey water. Free public transport pass on registration, pitches very large - plenty of room to choose which way to park. Hedges separating each \'street\'. Lidl and bakery within a few minutes walk of the site. Limited choice in the beer garden food wise. Easy walk into town. Lovely site in the Black Forest for short or long stays. Family run with good English spoken, nice restaurant currently in a large tepee (until the building is refurbished), but great food and nicely decorated. Very clean facilities in 2 blocks. Pitches are flat & grassy and of good size but may be muddy after rain. Quite a large proportion of permanent vans but nicely kept & mostly in separate areas. Local area has great cycling paths & nice riverside walks, with lovely swimming pool next door (free to campers), good playground, 2 supermarkets less than 500m away. Slight road noise but quiet at night. Good wifi (charge). Local tax is high but it entitles you to free transport on all buses and trains throughout the Black Forest area with a card from reception – great value if you use it. Very welcoming site and good English spoken by reception staff (thanks) All facilities clean and tidy. Very close to town and garage, 2 supermarkets. Little noise although clock bells and train line are close. Very handy for Stuttgart and scenic areas of Black Forest. We visited Freudenstadt and Bade Baden. This was a very pleasant stay. Recommended. Vill du boka Campingpark Bad Liebenzell eller få mera information? Det går bra med nedanstående uppgifter. 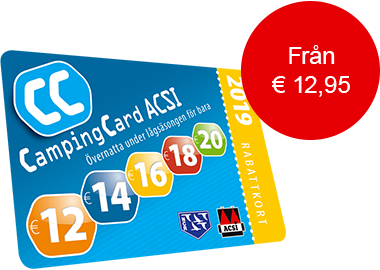 ACSI Eurocampings skickar din informationsförfrågan till "Campingpark Bad Liebenzell".